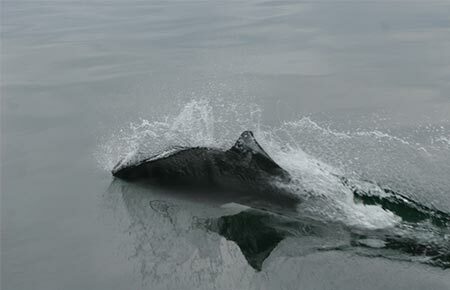 Dall's porpoise can be differentiated from dolphins and other porpoises by the distinct rooster tail of spray their dorsal fin makes at the surface of the water when travelling at high speeds. Phocoenoides dalli, commonly known as the Dall's porpoise, is most easily recognized by its unique black and white markings similar to those of a killer whale. Dall's porpoises are mostly black with large white sections on the sides, belly, on the edges of the flukes, and around the dorsal fin, though there are exceptions to this pattern. The average size of an adult is 6.4 feet and weighs approximately 300 lbs. The body is stocky and more powerful than other members of phocoenidae (porpoises). The head is small and lacks a distinct beak. The flippers are small, pointed, and located near the head. The dorsal fin is triangular in shape with a hooked tip. The mouth of the Dall's porpoise is small and has a slight underbite. Female Dall's porpoises reach sexual maturity at between three and six years of age and males around five to eight years, though there is little known about their mating habits. After a 12 month gestation period, a single calf is born, usually during mid-summer. The baby porpoise is about three feet long at birth. Calves and their mothers live separate from main porpoise herds for a period of time. Lactation lasts two to four months and Dall's porpoise usually have calves every three years. The average life span is 16–17 years. Dall's porpoises eat a wide variety of prey. In some areas they eat squid, but in other areas they may feed on small schooling fishes such as capelin, lantern fish (Myctophids), and herring. They generally forage at night. These are perhaps the fastest of the small cetaceans. They have been estimated at swimming as fast as 35 mph—a tie with killer whales as the fastest marine mammal. They are easily recognizable from a distance by the "rooster tail" splash that they make as they surface. This "rooster tail" splash creates a hollow cone, which allows the porpoise to breathe while still under the surface of the water. They generally travel in groups of 10-20, but at times their numbers can reach ten times that. They have an affinity for boats and will often come to ride alongside (bowriding) or behind them, and they have also been seen swimming alongside harbor porpoises and grey whales. Dall's porpoises live in the cold waters of the North Pacific Ocean. They range from Japan to southern California and up to Alaska and the Bering Sea. Throughout most of the eastern North Pacific they are present during all months of the year, although there may be seasonal onshore-offshore movements along the west coast of the continental United States, and winter movements of populations out of Prince William Sound and areas in the Gulf of Alaska and the Bering Sea. Dall's porpoise can be seen in offshore and onshore waters, and commonly in sounds and inland passages. They prefer deep water, and will use underwater canyons and deep channels to approach the coast. Estimates of total population size for the whole Northern Pacific in 1983 ranged from 790,000 to 2,300,000 animals. 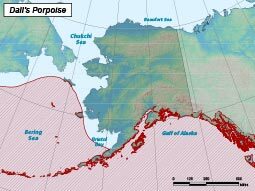 There are an estimated 83,400 Dall's porpoise in the Alaskan stock, though due to difficulties in gathering reliable population counts and lack of direct effort, these are not exact numbers. Killer whales and sharks are the natural predators of the Dall's porpoise; though because of their large body size, speed and agility, it's believed they generally escape predation. There is no Dall's porpoise fishery in the United States, but it is estimated that about 30 animals per year are killed as a result of being caught in fishing nets in Alaska. There is still an active Dall's porpoise fishery in Japan. Estimates suggested 40,367 Dall's porpoises were killed in 1989 from the Japanese hand-harpoon fishery alone. In recent years these numbers have declined because of the Japanese government's effort to regulate the hand-harpooning of these animals. In 1992, 11,403 were killed. This species is often killed accidentally in the Japanese seas and off of North America by drift nets set for salmon. Although the numbers of Dall's porpoise taken have been drastically reduced in the past decade, at one point it is estimated that over 20,000 were caught in Japan and over 4,000 in the US in a single year. The reduction in incidental catch is a result of better fishing equipment and practices. Females typically calve one young about every three years. The Dall's porpoise is capable of swimming in excess of 30 knots (about 35 mph) and is often seen swimming alongside the bows of boats (bowriding) or racing in the wake. Dall's porpoise was named by the American naturalist William Healey Dall who was the first to collect a specimen. Dall's porpoises are harvested by commercial fisheries in Japan. They also play a part in the success of marine ecotourism in other parts of the world.